Spartacus: Gods of the Arena follows the character Gannicus (Dustin Clare), the first gladiator representing Lentulus Batiatus to become Champion of Capua. The miniseries tells the story in a more ruthless time before Spartacus’ arrival where honor was just finding its way into the arena. Gods of the Arena takes place 5 years before Blood and Sand. 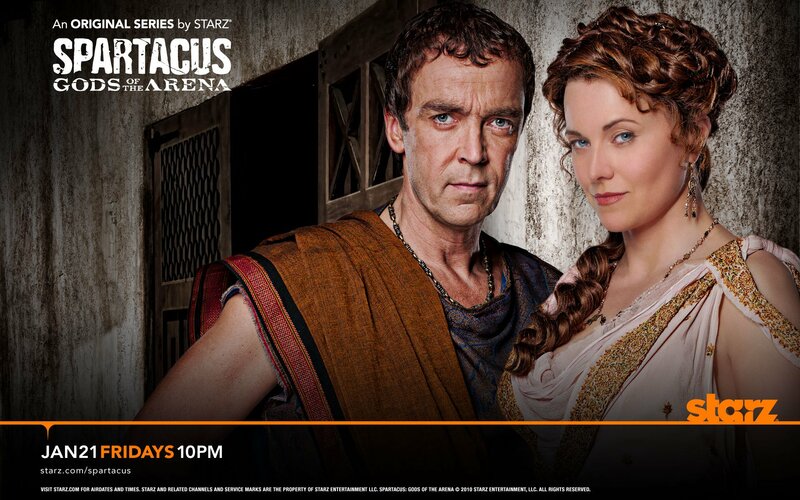 Batiatus (actor John Hannah) and Lucretia (actress Lucy Lawless) as wicked husband and evil wife in Spartacus: Blood and Sand. Gannicus proves himself a remarkable physical specimen: fearless in the arena and possessed by a thirst for the fleeting pleasures of life. His love of wine and women, coupled with his unwavering arrogance, is unmatched by any of the other gladiators. Thrusting his swords at the same time towards the opponent’s neck and either decapitating them or slashing their throats. Jumping towards a wall and performing a 360º flip and either kicking or slashing the opponent with his sword/s.